There’s people making a killing on the Asian domain grab of short domains.? If you had the foresight to get in before or at the start of it all congrats because you’ve done well for yourself.? I did not and I’ve chosen to sit on the sidelines for this instead of trying to jump in and I’ll tell you why. If you got in on these domains during the start (red section) you got in when the going was good on the uptick.? If you get in during the orange part of the curve then you will most likely lose money or break even.? The reasoning for this is because only a few lucky people will time the peak perfect.? Once the decline begins some people will think there’s a rebound coming so they’ll hold on longer.? And some people will sell because they know the peak has happened and now its on the decline and they’ll be lucky to scrape a small profit or break out even.? And if you buy or sell during the yellow section you are going to be a loser.? This is all assuming that these domains act like a penny stock where the bell curve scenario I just mentioned is very relevant.? I believe they will. This is also like a penny stock scheme because there’s no fundamentals.? There is nothing supporting these prices besides the people jumping in and buying them for even more then they sold yesterday because of the hype.? That’s all there is supporting these domains, hype.? There’s no practical use for most (or all) of these domains, just like there’s no true value for a pink sheet company that has $0 revenue and no true future prospect of revenue. With no fundamentals, and hype that will eventually fade there can only be a decline and I’m guessing it will be a fast and steep one at that once it begins.? It’s also curious (and interesting) that no one has seemed to pinpoint the reasoning for the start of the hype.? I’ve read that people in Asia as looking for alternative places to put their money, but why now?? I’m not buying that theory.? They could find their way into bitcoin if they wanted an alternative investment.? Or foreign real estate.? Or one of a ton of other options.? These domains could be had on the drop for $12 at GoDaddy for years and all of a sudden now they are a good investment?? Just like a penny stock pump and dump scheme its hard to pinpoint where the pumping began but the stock’s price action is almost always the same. If there’s a company that will pay big bucks to take random gibberish like YQZL.com or NXWQ.com or 86922222.com or 12388890.com and turn them into legit businesses then I’d love to see it.? There’s literally millions of variations of these types of domains that have had their prices pumped up yet the prices act like the domains are very scare.? Reminds me of the great tulip bulb price crash story which if you aren’t familiar with you can read here:? http://www.investopedia.com/features/crashes/crashes2.asp?? I wouldn’t want to have a barrel full of tulip bulbs (or meaningless/worthless domains) in lieu of cash. This all of course is my own personal opinion so take it for what you will.? The last thing I want to do is spend big bucks on garbage hoping that someone else will pay me a premium to take the garbage off my hands.? Yes, you could time it right and make a profit, but this isn’t domaining just like pink sheets aren’t stock investing… it’s a gamble so be prepared to hit a home run or go home empty handed. I don’t know if a bell curve is a good analogy. With that curve it means prices will drop down to $0 which I can’t see happening. 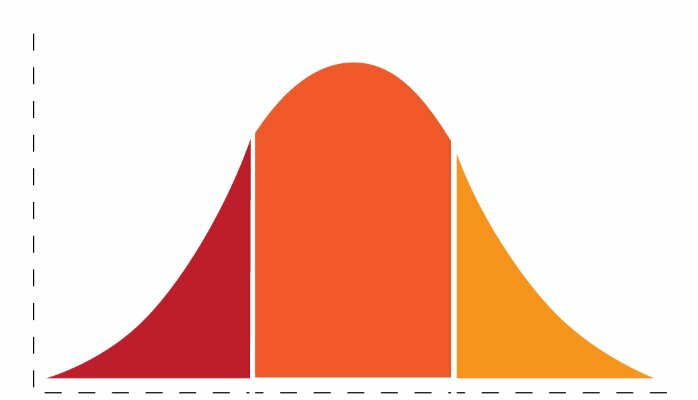 Even if it is a bell curve, how do we know if we’re at the top or just at the far left starting up the red section? That said, your guess is as good as anybodies as to how this will play out. If the demand from China eases off then there is nothing to support the current prices. It’s amazing to hear that groups out of China are calling the registries trying to accumulate blocks of domains. The bottom of the bell curve is registration price which is where a lot of the previously undesirable LLLL.com and NNNNNN.com were sitting not too long ago. Who’s going to want to buy these domains from them for more then they paid? And what happens when renewals come up? Are they going to keep pumping money into renewing domains that aren’t generating revenue? You need to go to China or talk to someone who is Chinese then you will understand why 3, 4 numbers are $$$ and 5 numbers are a poor man’s porsche, 6 is a used 15 year old ford. When the surf comes in, don’t ask why the wave is here or worry about when they will stop. Wax your board and run for the beach. If you don’t have a board and now the boards are selling for 100x what they were a short time ago and you don’t know when the wave is going to stop is it worth paying for that board now? You can easily get stuck with a board you overpaid on and no waves.